This view of the back of the house shows how very large the "knuckle" really is. There is a lot of space enclosed within a volume that, from the front, looks rather diminutive! Even on the back, though, it is possible to see the strategies that were used to blend the old with the new and still attend to the human scale. 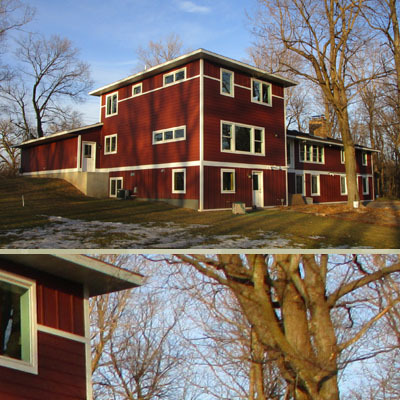 By using a different siding (board and batten) on the whole lower level of the house, there is a distinct visual connection between the old and the new, and a person approaching the "harvest" kitchen in the addition, isn't going to feel overwhelmed by the height of the addition because the strong trim band provides a visual relief to the height. Adding a touch of the board and batten siding at the very top of the addition, provides vertical unity as well.